Contribute to the community. 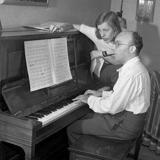 Add sheet music, tabs or chords for "Mit Auftrag des Herzogs an Euch bin ich mein zweites Mal hier - Kurt Weill". Request this song. Then, some users will may try to write sheet music, tabs or chords for "Mit Auftrag des Herzogs an Euch bin ich mein zweites Mal hier - Kurt Weill". Jellynote won't provide sheet music itself!